I'm always on the hunt for simple recipes to make on a weeknight. After a long day of work and usually working out, by the time I'm home and ready to cook, it's well past the time that most people would eat dinner. 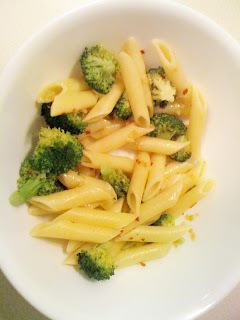 I recently discovered a great recipe for garlic broccoli penne on vegweb.com - a great site that houses vegan recipes for just about anything. If you like garlic and broccoli, you have to try out this recipe. 1. Prepare penne according to package directions and drain. 2. Meanwhile steam broccoli until just tender. 3. In a large frying pan saute garlic in olive oil until fragrant, remove from heat. Stir in pepper flakes & salt. 4. Add penne & broccoli, stirring to coat with garlic mixture. Transfer to serving dishes & sprinkle with parsley. Serve immediately. I generally like anything with garlic, but broccoli? I'm iffy about broccoli. It has to be cooked just right. But this ended up being really good - and ridiculously garlicy. If you don't like garlic, cut down on the number of cloves you use. (Unless you're trying to keep vampires away or something.) I don't like parsley, so I didn't use any. I also used "regular" pasta instead of multi-grain, since that's what I have in my cupboard. I'd definitely make this recipe again. The meat eater I fed this to was even a fan, so this could be a great entree to serve to your non-vegetarian/vegan friends. The original recipe says the ingredients makes two servings, but you could easily stretch this to serve 3 people or as a side dish for 4. Mmm, you can never be too rich or have too much garlic! Looks yummy!